After Gregg Pilling left the Suns he went on to coach the Roanoke Valley Rebels. 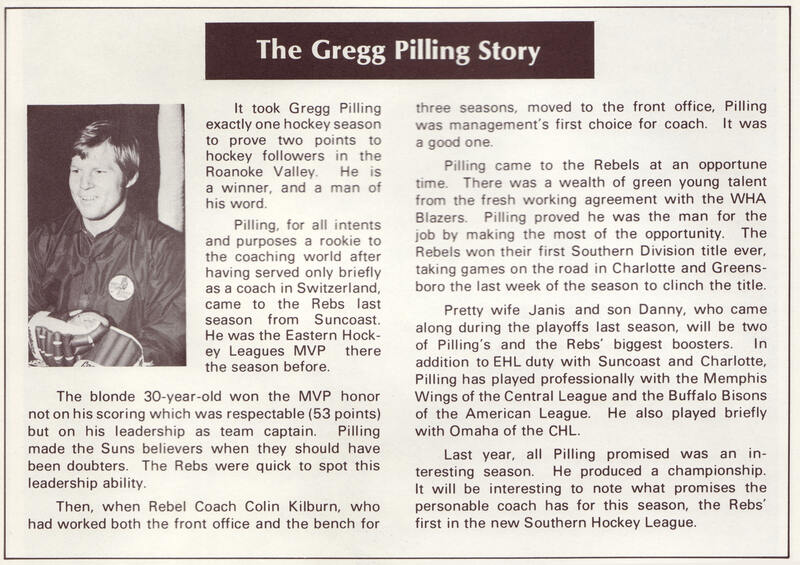 Here is a nice story about Gregg from a 1973-74 Rebels game program. Here is a essay submitted by former Cape Cod Cubs radio broadcaster Jon Wetterlow to our website. Joe Sherman sent an update as well. Thanks to both gentlemen for their time and efforts here. The Cape Cod Cubs arrived as an expansion team in the Eastern Hockey League in time for the 1972-73 season, playing in the brand new 5,000-seat Cape Cod Coliseum. Team President Richard “Bud” Terrio’s dream of bringing professional hockey to Cape Cod had finally come true. The Cubs enjoyed considerable first-year success under General Manager Jack Crawford and Coach Bronco Horvath, both former Boston Bruins’ stars, and Communications Director Joe Sherman, who was later to become General Manager. They won the EHL’s Central Division championship, but were later eliminated from the playoffs by eventual champion Syracuse, one of the most powerful minor league teams ever assembled. A highlight of that inaugural season was a January 1973 trip to St. Petersburg, Fla., for a two game set against the Suncoast Suns. The Eastern League was a notorious bus league; no unnecessary expenses were to be incurred, so teams generally traveled to and from away games by bus, often arriving home around dawn the next day. But not this trip to St. Pete. The Cubs traveled like National Hockey Leaguers -- departing Boston’s Logan Airport for the weekend trip to St. Pete. It was a chance to escape away from a New England winter -- at least for the weekend. The Bayfront Center, home of the Suns, had a beautiful setting overlooking Tampa Bay, whose calm waters were sprinkled with all sorts of yachts, and it was adjacent to Al Lang Field, a famous Spring Training site. The Cubs and the Suns met Friday and Saturday nights, and then it was back to reality -- an early Sunday morning departure for Boston, a bus ride to Woonsocket, R.I., and a Sunday night game there against the Rhode Island Eagles, like the Cubs another expansion team. Three games in as many nights! 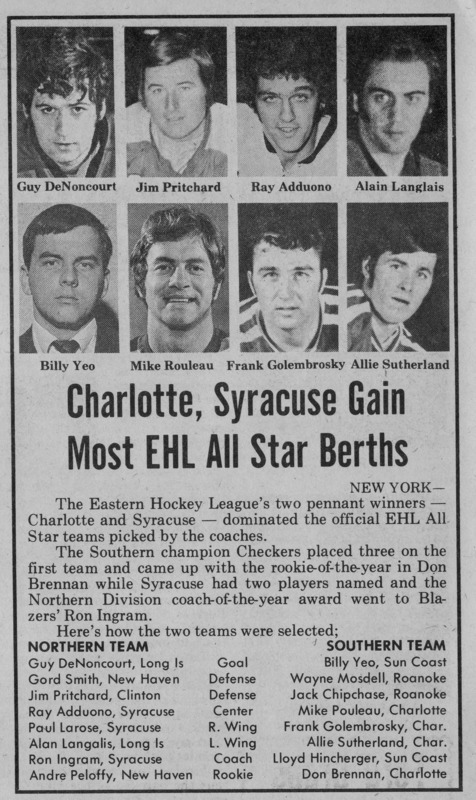 Unfortunately, the trip to St. Pete was a one-time experience because the Suns along with the rest of the Eastern League’s Southern Division --Charlotte, Greensboro and Roanoke Valley -- broke away to form the Southern Hockey League for the 1973-74 season. The Cubs became charter members of the new North American Hockey League, along with Maine, Long Island, Syracuse, Mohawk Valley, Johnstown, Binghamton and Philadelphia. There was some player movement between Cape Cod and the Suns. Defenseman Dan Cowley played two seasons for the Suns before joining Cape Cod for the 1973-74 season. His name was well known in the Greater Boston area, his dad Bill having played for the Bruins. Denis Lemieux, John Raynak, Wayne Hawrysh and Bill Berglund were other former Suns who later found themselves in Cape Cod uniforms. Similarly, Jacques Royer and Rick Barefoot, original Cubs, saw service with the Suns in the 1973-74 season. Royer played left wing on one of pro hockey’s highest scoring lines in the 1972-73 Cubs’ season, joining his Granby, Quebec, buddy Luc Simard and Jim Sherritt. Simard, playing right wing, scored 68 goals and totaled 124 points in the Cubs’ inaugural year, and center Sherritt earned himself a contract with the Houston Aeros of the WHA, where he skated on a line with the legendary Gordie Howe. I happened to come across an early-season 1973-74 Cape Cod Cubs program. It was from a game against Binghamton on Oct. 30, so a number of "plugger" items were used to fill space until we got deeper into the season and could add new photos and stories. One of those items was a list of all game scores from the previous season. Thus, I can now give you with absolute certainty the results of the Cape Cod-Suncoast games in 1972-73. The first time the two teams met was on Oct. 24, 1972, at the Cape Cod Coliseum, where the Cubs edged the Suns, 5-4. On Jan. 5 and 6, 1973, the Cubs played at the Bayfront Center and suffered back-to-back losses by scores of 7-6 and 10-7. On Jan. 16, the Suns made a return visit to Cape Cod and beat the Cubs, 3-2, at the Coliseum. Thus, the expansion Cubs lost three of four to the Suncoast Suns en route to winning the EHL's Central Division championship with a 36-29-11 record for 83 points, 10 ahead of second-place Rhode Island (32-35-9), coached by Larry Kish. Oh, Jon, that game in Woonsocket the night the team flew back from St. Pete wound up as a 5-5 tie!